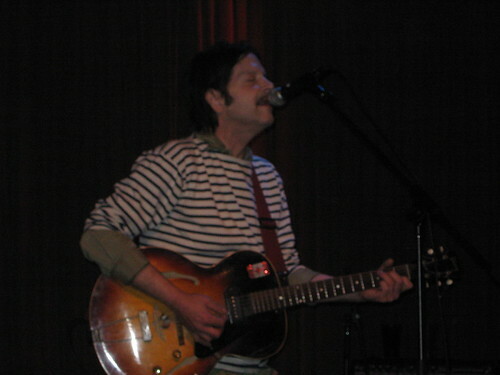 On the Saturday night of the Great Blizzard of 2009, Grant Hart performed before a fairly modest crowd at the 92Y Tribeca. Ever gregarious, Grant chatted with the diehards before, during and after the show. His inspired set drew equally from the three phases of his career, with seven Husker Du numbers scattered among a twenty-one song set that also included Nova Mob and solo material. Grant is currently on tour in support of his latest album Hot Wax. Grant Hart returns to NYC next month for gigs at Cake Shop on January 14, Knitting Factory on January 15, and also an as yet unconfirmed date at either Bell House or Union Hall. We recorded this set with a soundboard feed supplemented with the Neumann microphones mounted fifteen feet from the stage. The sound quality is superb. Enjoy! If you email nyctaper for access to this recording, we expect that you will PLEASE SUPPORT Grant Hart, visit his website, and purchase his new albumÂ Hot Wax from the links at his website [HERE]. Let me be the first one to thank you very much! Grant Hart is still fab! Thanks for this “Christmas” offer!